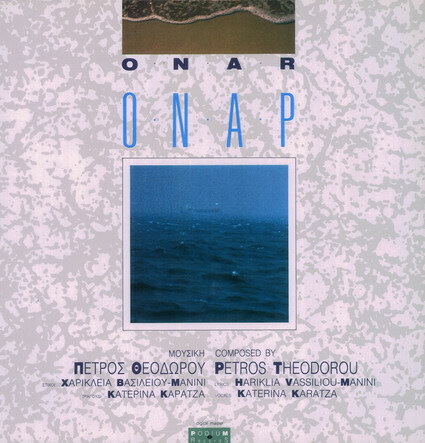 A composition for electronic instruments and voice, is Theodorou’s 1st LP album (1989), which later reappeared in a CD along with his 2nd LP album, «BEATRICE»(see: «CD BEATRICE – ONAR»). «ONAR» is a personal proposal for the use of music technology means so that «…an active relation between the composer and technology is maintained, as the composer, incorporates in his general intentions his tools which should not limit him in a sterile technocratic framework…». This work participated and was awarded a prize at the «Soundscape» Pan-European Competition of Musical Composition and Technology (Norwich, Great Britain). In «ONAR» Theodorou is mainly trying to link electronics with natural sound. This endeavor is part of his effort to approach music technology in a personal way, something that went on in many ways in his CDs «MUSICA PRACTICA» and «PHOENISSES». This music represents my initial attempts (since 1987) to incorporate the possibilities of music technology into my own means of expression. The whole of the orchestral part, the sounds, and the manner of playing of the instruments (the «interpretation») have been generated by and structured in the computer. Still, they provided in the final result the necessary space for the human voice. In «ONAR» I ‘have used electronics in musical styles that I usually avoid to use them for (no constant beat, a lot of «accelerandi», «ritenuti», «rubati», etc). I wanted to experiment with what these tools can do, how expressively can they be used in a lyric work. As far as the style of the pieces is concerned, I opted for «allusion» or, better, «reference», as a kind of tribute to various kinds of music that appeal to me. So the pieces contain references to the «sound – style» of Hadzidakis, Debussy, De Falla, folk songs, classical song, etc. As for the lyrics, their musical setting was based on the concept of a kind of dramatic «staging». (I always, even then, liked to work and structure my music using stage terms). I have divided each Hariklia’s poem into shorter parts, «images», which are narrated and «staged» by voice and orchestra. Neither of these two elements may be said to play a more important part than the other (this is why I prefer to call «ONAR» a work for voice and orchestra, rather than a collection of songs). This frequently resulted in strange, unusual forms. Each piece can be viewed as a sequence, a «collage» of tiny, diverse parts of music under a unique framework characterizing each piece. This was another challenge by «ONAR»: to blend conceptually and aesthetically in each piece these little and different between them parts of music in a coherent whole. Together with Katerina we decided to use her wonderful and many possibilities offering voice in a rather modest way. We also decided to keep her interpretation out of emotional exaggerations, so that the balance between the voice and music roles would be better served.